Special counsel Robert Mueller is not playing any games when it comes to this Russia investigation and the big fish he has caught in the wide net he cast. 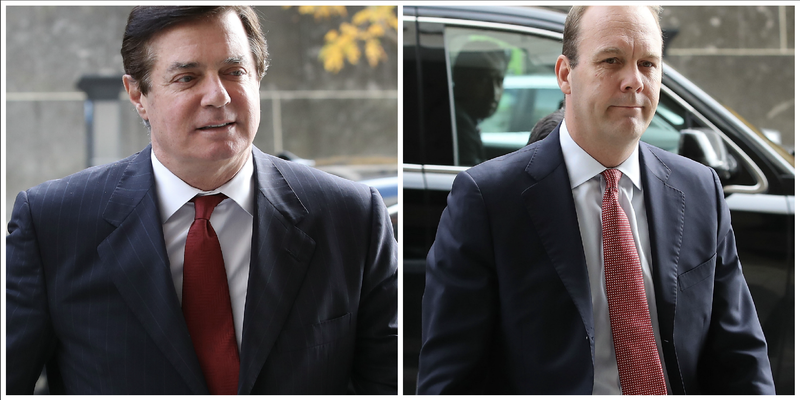 On Thursday he issued a new indictment against former Donald Trump campaign officials Paul Manafort and Rick Gates, charging them both with money laundering. CNN reports that the 37-page indictment charges the two with an elaborate scheme in which they allegedly laundered $30 million, failed to pay taxes for almost 10 years and used real estate they owned to fraudulently secure more than $20 million in loans. The latest charges come on the heels of an indictment issued Feb. 16, in which Mueller charged 13 Russian nationals and three Russian entities for their alleged roles in interfering with the 2016 U.S. presidential election. This latest indictment (pdf) alleges that Manafort and Gates laundered more than $30 million in income and “hid the existence and ownership of the foreign companies and bank accounts” they oversaw—fraud that they were able to commit by disguising their income as loans from shell corporations they ran. Both are alleged to have used some of the money to make improvements on their homes, refinance their mortgages and buy luxury goods. Manafort is also said to have purchased real estate in the United States with it, while Gates paid for his children’s tuition and his own mortgage. The men already faced a combined 12 criminal charges in federal court for alleged money laundering and failure to disclose banking information and foreign lobbying work they did prior to 2015—charges that are also connected to the offshore accounts referenced in the new indictment and charges that both pleaded not guilty to in October. With the new indictment, Manafort now faces an additional 18 charges, and Gates faces 23 new charges. CNN also reports that a sealed charge was added to their case Wednesday, but details about that charge are unknown. Bets on one or the other taking a deal from Mueller? Either way, as they say in the hood, these niggas going to jail.